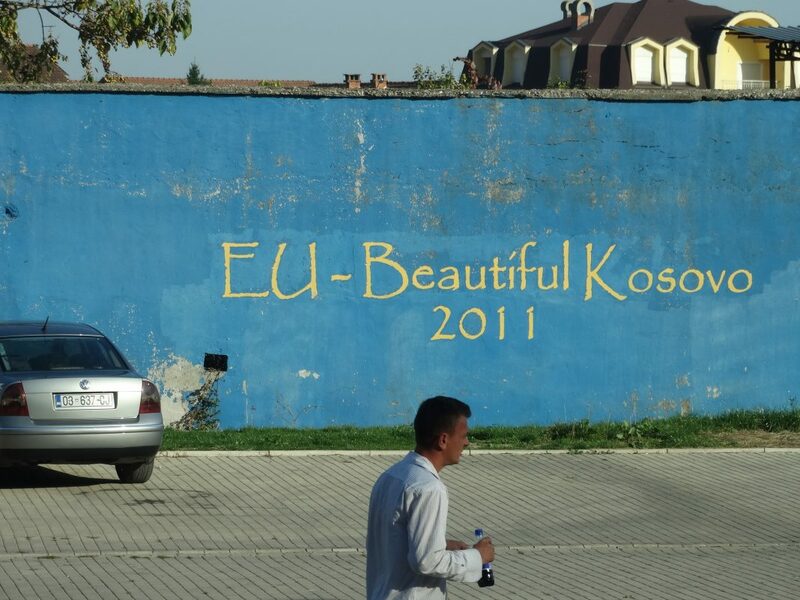 A pro-EU wall painting in a Kosovo town. In resolutions adopted on Tuesday, Foreign Affairs Committee MEPs mark the progress made in five Western Balkan countries on their path towards possible EU accession. In a report adopted by 49 votes to 3 with 6 abstentions, MEPs welcome Serbia’s continued engagement on the path of integration into the EU and call for this strategic decision to be actively promoted among the Serbian public. They also highlight Serbia’s efforts to normalise ties with neighbouring Kosovo and support the dialogue facilitated by the EU as the framework to reach a comprehensive normalisation agreement. While taking note of the recent debate on possible exchanges of territories between Serbia and Kosovo, MEPs underline that ethnically homogenous states should not be the objective in the region, and only consider any future agreement acceptable if mutually agreed between Serbia and Kosovo and if it takes into account the overall stability in the region and international law. MEPs urge Serbian authorities to step up reform efforts on the rule of law, intensify the fight against corruption and organised crime, and continue to reform the country’s public administration to make it more politically neutral . Serbia should be more aligned with the EU’s foreign and security policy, including on Russia, and within the United Nations. MEPs welcome the legislation passed within the European Reform Agenda , but express concern at the lack of cross-party consensus and lingering political polarisation in Kosovo, which continues to adversely affect the path to sustainable reform. To bring Kosovo closer to the EU, visa liberalisation is vital to Kosovo without undue delay. MEPs welcome that the European Commission has confirmed that the visa liberalisation benchmarks have been fulfilled. This comes notwithstanding critical concerns about Kosovo’s under-financed judiciary, widespread corruption, elements of state capture and undue political influence and due process, which all need to be addressed beyond the progress made on meeting visa liberalisation requirements. The resolution takes note that five EU member states have not yet recognised Kosovo and invites them to do so, since this would ease relations between Kosovo and neighbouring Serbia. The resolution was approved by 42 votes to 10 with 6 abstentions. MEPs praise the country’s strong commitment to fully implementing the 2015 Pržino Agreement and the Urgent Reform priorities, which has led to intensified efforts on EU reform. They also call on the national authorities to intensify the fight against money laundering and conflicts of interest, to better shield the judiciary from political interference, ensure the independence of media outlets and address remaining rule of law problems. The resolution was approved by 47 votes to 9, with 1 abstentions. Following the uncertain outcome of the referendum in the former Yugoslav Republic of Macedonia on 30 September 2018 (which sought public support to change the country’s name to the Republic of North Macedonia), MEPs encourage the government in Skopje to do what is necessary to honour the 17 June Prespa agreement between the country and Greece, which opens the door to EU and NATO accession negotiations. In a resolution adopted by 44 votes to 5, with 5 abstentions, MEPs welcome Albania’s steady progress on EU-related reforms and the further steps taken to boost the independence and professionalism of the country’s judiciary. While commending the significant improvements made by Albania to strengthen its legal and institutional framework, as well as the progress achieved in the fight against organised crime, MEPs also remain concerned over the high level of corruption , the lingering slow pace and inefficiency of the justice system and the fact that rule-of-law deficiencies and cumbersome regulatory procedures continue to deter investment in the country . Nevertheless, the resolution endorses the path set out by the Council to open EU accession negotiations with Albania in June 2019, provided that the country meets all necessary conditions. While Montenegro is making good progress overall in the EU integration process, MEPs call on the country’s political leadership to prioritise tackling problems with the rule of law, media freedom, corruption, money laundering, organised crime and its associated violence . The resolution, approved by 47 votes to 5 with 5 abstentions, underlines Montenegro’s efforts for constructive regional cooperation and good bilateral neighbourly relations. MEPs also welcome the ratification of the State Border Agreement between Montenegro and Kosovo, and call for outstanding border disputes with other neighbouring countries to be resolved quickly. The text finally recalls the strategic importance of Montenegro’s NATO accession on 5 June 2017 for ensuring stability and peace in the Western Balkans. Following the committee votes, the resolutions are scheduled to be tabled for a plenary vote during the November mini plenary session in Brussels.